You've added Mirage Volcano, Big Bus Tours, Eiffel Tower Experience at Paris Las Vegas, and other attractions to your itinerary. Do some cultural sightseeing at The Strip and Madame Tussauds - Las Vegas. 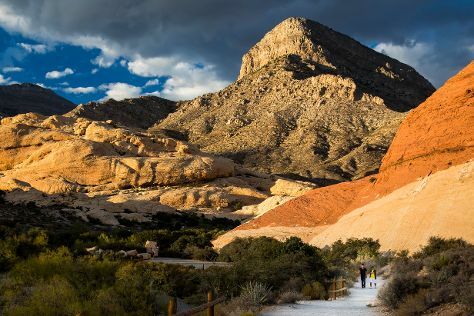 Take a break from the city and head to Red Rock Canyon National Conservation Area and Lake Mead National Recreation Area. You'll find plenty of places to visit near Las Vegas: Valley of Fire State Park (in Overton) and Hoover Dam (in Boulder City). There's much more to do: admire the local landmark of Bellagio Fountains, try your luck at Paris Las Vegas, and admire the natural beauty at Bellagio Conservatory & Botanical Gardens. To find traveler tips, where to stay, and tourist information, refer to the Las Vegas driving holiday planner . In November in Las Vegas, expect temperatures between 68°F during the day and 47°F at night. Wrap up your sightseeing on the 26th (Mon) early enough to travel back home.